Description: The GBPRA pulls out of the yard to head east. 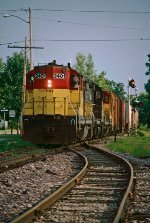 Description: The GBBUA rolls past the east end of CF siding. The remains of a semaphore are seen on the right. Description: The GBPRA heads down the middle of Broad St. Description: The GBPRA heads east along the west shore of Lake Winnebago. The distance signal is for the Fox River bridge. Description: The GBPRA heads east to Butler. Description: The GBPRA heads east out of town. Description: The GBPRA rolls east to Butler. Description: The GBPRA heads into town. 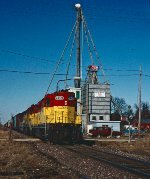 Description: The FRVR's three SD's lead the PRANA over New York Ave. and past the eastbound distance signal for the Fox River Bridge. 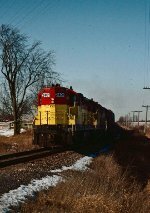 Description: The FRVR's three SD's lead the PRANA west to Green Bay. 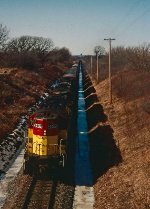 Description: The FRVR's three SD's lead the PRANA across the short bridge and the long bridge over Little Lake Butte des Mortes. Description: THe FRVR's three SD's lead the PRANA across the long bridge over Little Lake Butte des Mortes. Description: eastbound at Fondulac Wi. 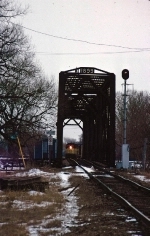 Description: The PRANA is about to head across the 1899 built Fox River bridge. Description: The GBBUA (1701, 4508, 820, 832) heads into the west end of the yard after a power swap with the PRGBB (2401, 2402, 831, 4502). The WC's main line is in the foreground. Description: The PRGBB heads west to Oshkosh and Green Bay. 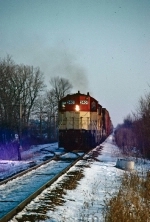 Description: The PRGBB passes the west siding switch at Black Wolf. Description: The PRGBB heads west at Lakeshore Dr. 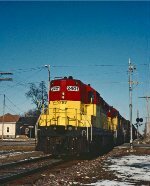 Description: Looking out of the firemans side of Wisconsin & Caulmet #901, an F7A, we see a SD-24 and NW-1.